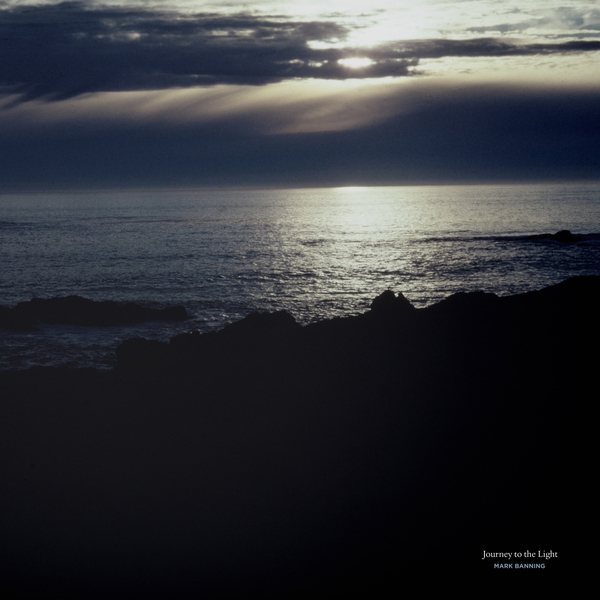 "Recorded in Northern California in 1984 and released in a micro edition by the Creative Sound imprint in January of the following year, Mark Banning’s Journey to the Light is a lost gem of private issue New Age music, an impossible-to-find album that is more spoken about than heard and deserves to be recognized alongside established classics of the genre. Incorporating processed electric guitar, zither, voice and field recordings, it is unabashedly beautiful music—two side-long pieces that feel as though they may have always existed, hanging in the air like a morning fog over the Pacific. As archetypal to the genre as Banning’s compositions might appear to be, Banning’s music has a seriousness and intensity that was absent from much of the New Age scene as it existed in the early ’80s. The album’s first piece, “Everlasting Moments,” charts a course between the weblike guitar cycles of Manuel Gottsching and the buoyant minimalism of Terry Riley. “A Sea of Glass” constructs itself similarly but navigates even calmer waters, providing a sensuous tapestry of ever-evolving guitar drones and radiant zither filigree. These heady, oddly prescient recordings were uncovered by New Age historian / figurehead Douglas Mcgowan (Yoga Records) and will appeal as much to fans of drone and ambient music as to those enamored with labyrinthine annals of American private press records, New Age as such, or with the recent renaissance of synthesizer-based experimental music. Remastered for presence and clarity by James Plotkin, this special reissue is the definitive edition of Banning’s transportive masterwork."